Bad fortune is a relative term when it comes to the inhabitants of Cornwall. While Francis complains about the loss of status and blisters [consequence of having to do some manual labour himself], poor JIM CARTER – the kid who poached - is [literally] rotting away in prison. As it turns out, there is a serious overpopulation issue at BODMIN JAIL and the prisoners have succumbed to illness. Here is a radical thought: if they didn’t arrest people who were stealing food to feed their starving families, they would have plenty of room for REAL criminals. Of course, where there is an injustice, Ross Poldark is there to impulsively try to rectify it. So he heads over to prison with DR.DWIGHT. After seeing the deplorable conditions of the inmates, the decide to break Jim out of jail… more like “extract” him because the kid couldn’t even walk. Unfortunately, Dwight is unable to save him and Jim dies. Yes… all that tragedy and we haven’t even reached the second act! Ross is deeply affected by his failure to save Jim and he decides to drown his sorrows just before they are scheduled to make an appearance at the WARLEGGANS BALL. Naturally, Ross decides to skip the ball because the last thing he wants is to socialize with people who are responsible for all all the injustice and inequality of the universe [according to him]. However, Verity convinces him to go by pointing out that he just broke a man out of prison and he should do some damage control. He refuses at first, of course; but Verity makes him realise that he has a daughter and wife to consider now. Speaking of wives… MARK DANIEL’s honeymoon period seems to be over [o never begun in the first place]. FLIRTY KEREN is not happy with the simple life Mark can provide and her eyes have been wandering to Dwight since the day of her wedding. Gotta give it him to Dwight, he did his best to ignore her advances for a decent amount of time; but when Keren finally shows up at his doorstep to “offer herself [to be his assistant]” he is too stunned to reject her. If she was looking for a marriage of convenience…Why did she go after a miner in the first place? Keren might be a gold-digger, but she is not a particularly bright one, is she? Lesson for honest simple men: don’t marry girls who ask for a house in advance/ Lesson for gold-diggers: Doctors are better prospects than miners. In the end, the whole Poldark clan attend the Warleggan’s ball. Unfortunately for Demelza, her first official ball is not a fairy tale moment. Ross is still deeply disturbed by Jim’s death, which means he won’t cease to drink [and his hair will take on a life of its own]. So Demelza begs Verity to stay with her and she does… for about two seconds until she sees Captain Blamey and ditches D [there goes the sisterhood]. 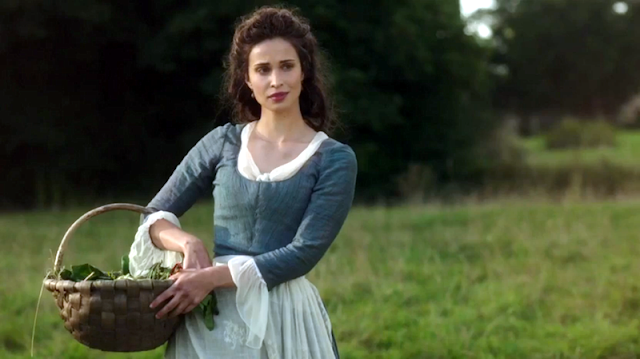 Well… it was Demelza who rekindled their romance, so she can’t really complain. Against Verity’s wishes, Captain Blamey decides to speak to Francis. He assumes that Francis has let go of their past differences [he hasn’t] and will be open minded for the sake of his sister’s happiness [he won’t]. The encounter between Francis and the Captain is once again disastrous and ends in a near-confrontation. Captain Blamey leaves the party without a glance back [not the mark of a romantic hero] and later sends a letter to Verity [via Demelza] asking her to choose between him and Francis. I don’t know about everyone else, but I think ultimatums are not the mark of true love. But that’s not all that happened at the ball. Without Verity as a wing woman, Demelza is left to fend for herself. I personally think she did a great job! She was poised, soft-spoken [yet witty], she impressed all the nay-sayers with her beauty and even managed to insult Ruth [formerly Teague] with the right mixture of sass and decorum. The men, however, did not behave so properly. Francis and Ross retreat to play cards with none other than PROFESSIONAL LIFE RUINER MATTHEW SANSON [who took Francis’s mine not so long ago]. Elizabeth is the first to call them on their bad behaviour and she does so by passive-aggressively pointing out that Ross has been neglecting his wife and she has been getting attention elsewhere. I am not so sure what to make of this. Elizabeth’s words [“Absentee husbands make for wandering wives”] were obviously directed at Francis rather than Ross… which is perfectly fine, but I don’t know why she had to get Demelza in the middle of it. So Ross finds Demelza and isn’t too pleased to discover that she hasn’t been lacking dance partners. He then proceeds to go on a diatribe about the hypocrisy of high class society. I generally agree with Ross’s concepts, but the 10+ glasses of scotch [or whatever he drinks] were not really helping his delivery in this instance. Demelza calls him out on his faulty logic by pointing out that ignorance and stupidity are not the prerogative of high society. Furthermore, Ross won’t right any wrongs by drinking and gambling [Am I the only one who yelled “you go girl” in that moment?]. I love how both Demelza and Elizabeth were upset with their husband’s; but, while Elizabeth opted for a very repressed “don’t say what you really mean” approach, Demelza just told it like it is [that’s 18th century girl power for you]. In any case, this is not the end of the mining related conflicts. Not long before, Carnmore made a splash at its first auction. This didn’t please the other smelting companies who won’t give up their oligopoly that easily. The Warleggans embark on a corporate espionage mission to discover who the mysterious Carnmore shareholders are. They come upon one name: Tressider and they get ready to ruin him and all the rest. Dun dun dun. I think Elizabeth was criticizing both men. I'm surprised you didn't consider it. By the way . . . passive aggressive? Or perhaps she was being subtle in a public place?